Wanting to eat healthy but limited on time is a dilemma I am often up against. Melissa's produce, a distributor of produce from around the world, makes it easier with their fridge to plate ready products. Things like: beets, potatoes, artichokes, and chickpeas are trimmed, peeled, steamed and vacuum sealed for freshness. When craving a salad for a mid-day meal all that is required is throwing together some of your favorite products and mixing up a dressing from scratch. With so many delicious veggies to choose it is easy to include otherwise time consuming veggies into your daily meals. 1 bunch watercress, stems removed, leaves rinsed and cut into bite-size pieces. Combine the vinegar, honey, and mustard in a food processor, and mix well. Add the oil in a slow, steady stream while the machine is still running. Continue to blend until the vinaigrette is emulsified. Add thyme and season with salt & pepper. Place the dandelion greens and the watercress in a large bowl and toss with 1/4 cup of dressing. Taste and add more dressing if needed. In a separate bowl, toss the sliced beets and walnuts in 1 tablespoon of dressing. Divide the greens amongst plates, and garnish with feta. Spoon desired amount of beets and walnuts over each plate. 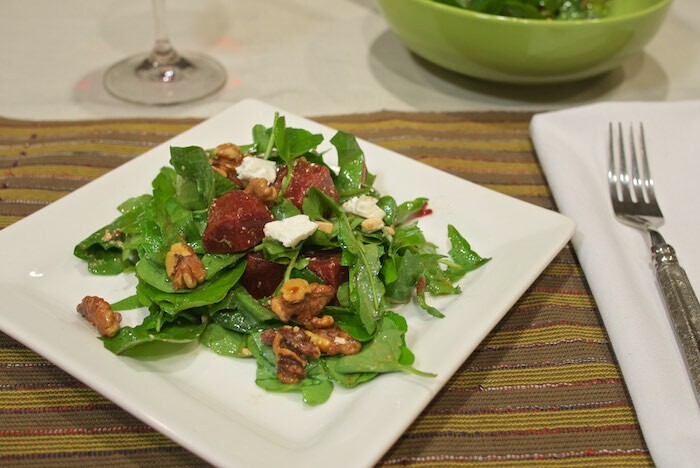 I love healthy salads �� and this one looks delicious! This salad looks so refreshing and tasty! Beets are good in salads! Great recipe for my lunch today! This salad looks super fresh and yummy! I definitely struggle with healthy eating when I'm short for time (which is basically every week day! ), you gotta love anything that makes it easier! I love beets! Eat them every day! Such a yummy healthy meal! Beets are awesome and this salad looks delicious. That vinaigrette sounds so yummy! That dressing sounds amazing! And I love the addition of dandelion greens. That dressing has me drooling, major yum! I love beets in a salad...and that dressing...yum! This looks so good!! Healthy eating usually takes so much time and effort that I don't do it, but this seems so easy. I love big chunks of beets, and they sound like an awesome addition to dandelion greens! I buy Melissa's shallots all the time but I've never seen the beets. I'll be on the lookout for them now. I love beets! I have never had dandelion greens. I love anything with beets though. This salad sounds wonderful. I enjoy using beets in salads. Can't wait to try your version. I've never seen baby dandelion greens before! I bet they're amazing in salads. Love this salad, the beets, watercress, dandelion greens, it's all perfection. We've been eating out a lot lately and I'm craving something healthy right now. This look perfect. I love dandelion greens but I usually juice them. I've never tried them in a salad. I have no idea why. I will try it next time! I've heard so many people using Dandelion greens in their salads and I have yet to try it! Gotta try this one soon! Yum, sounds delish! Quick and healthy, love that! Beet salads are the best! I Love beet salad with Thyme dressing. That is a wonderful taste contrast. Great Recipe. I'd definitely add a beef, chicken or shrimp addition. But it looks great!! I'm hungry for salad now! !